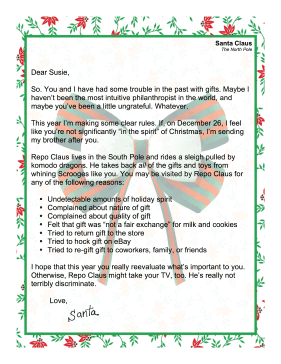 This funny letter from Santa warns ungrateful recipients that "Repo" Claus will come take away their presents. So. You and I have had some trouble in the past with gifts. Maybe I haven't been the most intuitive philanthropist in the world, and maybe you've been a little ungrateful. Whatever. This year I'm making some clear rules. If, on December 26, I feel like you're not significantly 'in the spirit' of Christmas, I'm sending my brother after you. I hope that this year you really reevaluate what's important to you. Otherwise, Repo Claus might take your TV, too. He's really not terribly discriminate.